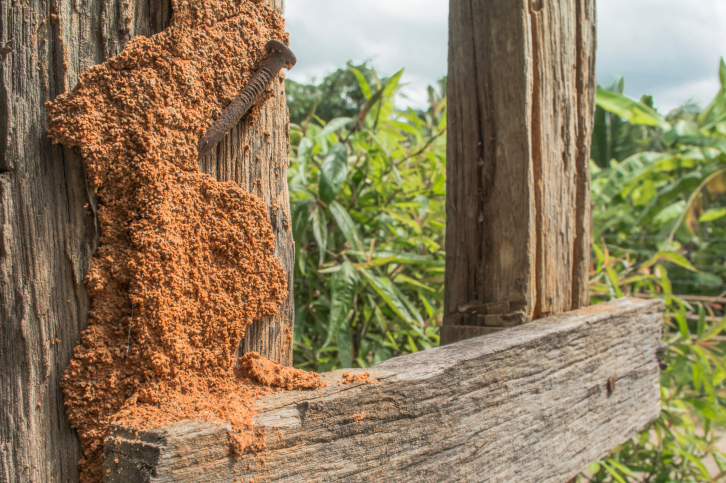 Massive termite nests like this one are absolutely no friend to your wooden fence. If things keep going in the direction they’re going, it’ll be spring soon! (And by that we mean, “if the earth keeps revolving around the sun…” — which we hope it does — “…it’ll be spring soon!”) When it finally does warm up, we’ll finally get to enjoy the outdoors again. Birds will be chirping, flowers will be blooming, and your outdoor living space, enclosed by your gorgeous Hercules wooden fence, will be thriving. Unfortunately, along with all the good, must come some bad. In this case, that bad is termites. The big giveaway for hidden termite infestations are the holes that they leave behind. Termites gnaw their way through wood, leaving holes, and potentially even causing splits in the wood. If you suspect termite damage but can’t see any termites to be sure, taking a cross-section of the wood in question will tell you for sure. Subterranean termites eat soft wood and eat along the grain, leaving behind a honeycomb pattern, while drywood termites will chew large sections of wood against the wood grain, leaving tunnels. Either way, fence termite damage will significantly harm the structural integrity of your fence. Now here are some tips to prevent this. Remove sources of moisture. Damp areas are big breeding grounds for termites. Particularly during the spring rainy season, make sure there are no gutter systems that are collecting a lot of standing water or overly soaking the ground. Look for other nearby sources of wood. If there are termites living in a nearby mulched area or tree stump, they’re more than likely to eventually migrate to your fence. After all, to them, wood is wood is wood. 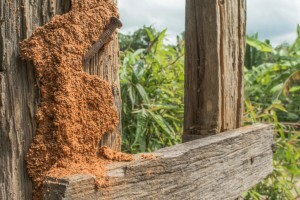 If you’re concerned about termite damage in your wood fence, act quickly when deciding to call an exterminator. The faster you eliminate the problem, the more likely it is that you’ll save your fence’s life. This entry was posted on Thursday, February 25th, 2016 at 9:48 pm. Both comments and pings are currently closed.